¡El cálido sol de Florida y la playa de arena te esperan! Summit 1231 es un condominio de un dormitorio, un baño y medio que duerme, seis personas. Contempla la impresionante vista del Golfo de México, el maravilloso balcón, la conexión WiFi gratuita, las dos piscinas frente al golfo, las dos piscinas para niños, el restaurante junto a la piscina y el tiki bar. 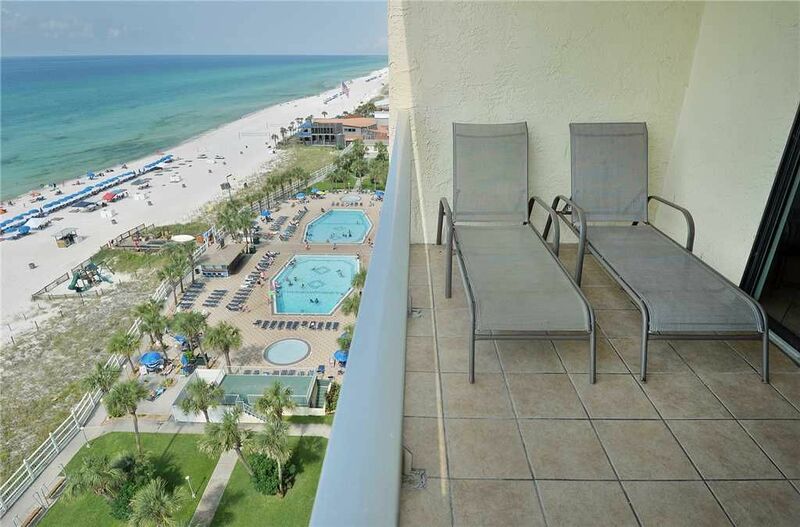 Summit 1231 es el lugar perfecto para llamar hogar durante sus vacaciones en Panama City Beach. Este condominio ofrece mucho espacio y está bellamente decorado. Al entrar, notará el concepto abierto, las literas exclusivas en el hueco del pasillo y los asombrosos ventanales del piso al techo y la puerta corrediza de vidrio en la sala de estar principal. La sala de estar cuenta con un sofá grande y un sofá de dos plazas situados alrededor del televisor de pantalla plana. Usted y sus invitados amarán todo el espacio en la sala de estar principal. La cocina completamente equipada cuenta con electrodomésticos blancos y un montón de espacio en el mostrador. Está totalmente equipado con lavaplatos, microondas, refrigerador y congelador, anafe con horno y utensilios para cocinar y comer para preparar deliciosas comidas durante su estancia. La barra de desayuno ofrece asientos para tres personas con un área de comedor adicional con una mesa de comedor y asientos para cuatro. Después de la cena, salga al balcón y disfrute de los tranquilos sonidos y la vista del Golfo de México. Summit 1231 ofrece un increíble balcón privado con dos sillones chaise y un par de sillas. Disfruta de tu café de la mañana aquí o sumérgete en un buen libro mientras te relajas en privado. El balcón ofrece espacio de entretenimiento adicional y los huéspedes de todas las edades disfrutarán utilizando esta área. Summit 1231 cuenta con un dormitorio principal privado con una cama king-size, una cómoda con un televisor de pantalla plana y mucho espacio para sentirse como en casa. El dormitorio principal está equipado con hermosos muebles. Disfrute de la comodidad del baño privado que ofrece todas las necesidades para su estadía. ¡Esta propiedad también ofrece una exclusiva alcoba con literas incorporada a la pared en el pasillo! Es el lugar perfecto para que los niños se sientan como en casa durante su estadía. También hay un sofá cama Queen ubicado en el salón principal para recibir huéspedes adicionales. Ropa de cama y toallas se proporcionan para todos los huéspedes a utilizar durante su estancia. Summit 1231 ofrece maravillosas comodidades para los huéspedes. Entre estos servicios, asegúrate de ver las dos hermosas piscinas, una de ellas climatizada por temporada, dos jacuzzis y una increíble área privada de piscinas para niños. Si empiezas a sentir el hambre, echa un vistazo al restaurante de la piscina y al tiki bar. Bikini Bob's también es muy conveniente para los huéspedes. La propiedad tiene todo lo que necesita y es muy conveniente para que sus vacaciones en Panama City Beach sean perfectas. Este condominio está bien cuidado y muy bien decorado. Te sentirás como en casa desde el momento en que entras en este hermoso condominio. Summit 1231 se encuentra a poca distancia de la playa de arena. Una lavadora y secadora también están disponibles para los huéspedes y le permite empacar la luz. Visitar Panama City Beach en cualquier época del año ofrece el mejor lugar de vacaciones para usted y sus invitados. Las excelentes piscinas, jacuzzis, piscina para niños y la comodidad de la playa hacen de esta propiedad una excelente opción para su hogar lejos del hogar. ¿Que estas esperando? ¡Llame ahora para reservar Summit 1231 y prepárese para unas vacaciones inolvidables! Nota importante: Summit cobra una tarifa de registro de $ 20 por condominio al momento del registro ($ 40 durante las vacaciones de primavera). Nice location, looked clean upon arrival, good space. The property was nice. The sheets were stained and dirty on the long bed. The location was nice and everything ran well. It worked well for 6 girls on spring break. The departure instructions were confusing. There’s was a list on the dryer which was different from the ones in the email so it was confusing which to follow. Overall the place was nice and affordable. Thank you for your feedback! We are happy to hear that you enjoyed your time during Spring Break. It was our pleasure to host you and your friends. We hope that you have made many memories. If there was anything else that we could have done to improve your stay, it would have been our pleasure to do so. We take pride into our attention for details and apologize if anything was overlooked. We will review the property instructions to make sure that they are correct and easily understood for all guests. Again, we thank you for your feedback and we hope to see you next time. Dirt everywhere, the dishes were in the drawer and they were dirty. The inside of the fridge was dirty, it didnt look like the blankets on the bed had been washed in months. There was dirt packed on the walls where the AC blew out. The door handle was broken to the patio door, the furniture on the patio was rusted and gross. The shower was dirty, The patio curtain was yellow instead of white. This place is so out dated. The kitchen had mirror's for backsplash and mirror socket covers?? The couches were stained. It was bad! The condo was clean, fresh, and well equip...loved the washer and dryer!! The condo was nice. The atmosphere was not. The Summit was filled with a lot of college kids. This created a lot of unruly conversations and actions that are not appropriate for families with young children. Great atmosphere if you are in your 20s. Thank you for sharing you comments and concerns. We are glad that you enjoyed the condo and were sad to hear of your not so pleasant experience. Panama City Beach has a little bit of everything for everyone but has definitely come a long way from the party days and transforming into a more family-friendly destination. We understand your discontentment as this is not what we intended for you. Guest satisfaction is important to us and the condo association does urge both residents and guests to be respectful of their surroundings. We hope that you will not let this instance deter you from returning to the area as we would love to host you once more. Again, we thank you for sharing your feedback and if you are ever in the Panama City Beach area again, we will be here waiting for you. Until then, happy vacationing. Had an enjoyable stay - LOVED the free beach chairs! This property could use an update, but is suitable. Everything is just older and a little outdated. When we arrived, the condo had a very musty smell. The humidifier was turned on, but it was very stuffy. We ended up buying a couple of febreze plug ins to tolerate it. After a couple of days it wasn't bad. Cleanliness overall was ok.
My daughter was going to use some of the extra blankets that were in the bedroom closet, but they smelled like they haven't been washed in a while. The washing machine in the condo is too small to wash them I think , so we didn't use them. I would suggest a wash of the extra blankets. The extra pillows looked and smelled like they were pretty old and need replaced. The kitchen had sufficient supplies to cook dinner, but I would suggest washing anything before using it. You could tell some of them hadn't been used in a while and needed washed. The kitchen is small, but who wants to be in the kitchen that much when you're on vacation?!? The washing machine in the condo is wonderful. A bit noisy for those in the living room, but I did most of the washing at night when everyone else was in bed (there is a door that can close off the hallway/bedroom area from the main living area so the noise wasn't bad). The Summit itself is a bit older, but still enjoyable. Elevators were terribly slow and would often skip floors and stop at floors where no one was. This wasn't a terrible inconvenience, but other guests got irritated. 1231 is just outside the elevator doors, so very convenient! Security was very prevalent, and that was reassuring. Bikini Bob's was nice to have on site for quick snack/drink. The pools/hot tubs were great! The playground had yellow tape across the entrance and my son was very disappointed, so we asked a security guard and he told us it was ok to play on, just that they were going to be replacing it with an updated one at some point. It was very useful during our stay. We loved the 'take a toy, leave a toy box'. I was worried with being so close to Club LaVela that the area would be over run with spring breakers, but it wasn't. All in all, we had a great time at The Summit, 1231! Hello Lisa, we want to thank you for taking the time to write out this thoughtful review for us. We really appreciate it. We are overjoyed to hear that you loved your stay with us at The Summit. Feedback like yours is extremely helpful for us as it gives us multiple opportunities to mprove and to rectify any issues that were addressed. We will work with our teams to make sure that our extra blankets are washed and taken care of for our next guests. And, we will take your feedback into consideration about updating the unit. We really want to thank you again for taking the time to write us this review, we appreciate it very much. We hope that we can host you again in the future. Thank you! Las tarifas mostradas arriba no incluyen impuestos y tasas Cuota de reserva: 6% Base de la carga: AD Para estancias entre 1 y 365 noches. Tarifa de limpieza 1-4 nts: $ 100 Base de carga: ESTANCIA Para estancias entre 1 y 4 noches. Tarifa de limpieza 28+ nts: $ 149 Base de carga: ESTANCIA Tarifa de limpieza 5-27 nts: $ 125 Base de carga: ESTANCIA Para estancias entre 5 y 27 noches. Protección contra daños 1 BRN: $ 65 Base de carga: ESTANCIA Para estancias entre 1 y 365 noches.